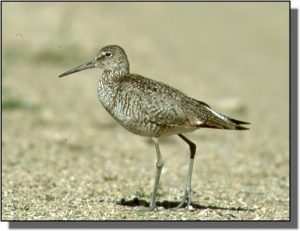 Description: The pigeon-sized Willet has blue legs and a heavy, straight bill. Only slightly longer than the length of the head, the bill is black at the tip and gray-green at the base. In breeding plumage, it is heavily patterned with dark, gray-brown and white feathers on its back, neck, head and chest. Nonbreeding plumage is plain gray or brown. A bold black and white contrasting wing pattern is seen in flight. 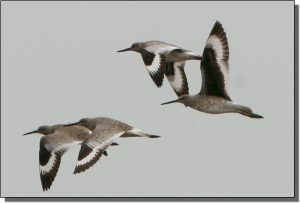 Similar Species: This species is separated from both species of yellowlegs by being larger, stockier and having blue legs. Willets are grayer in plumage with a straight bill which is shorter and heavier than that of a curlew, godwit or dowitcher. 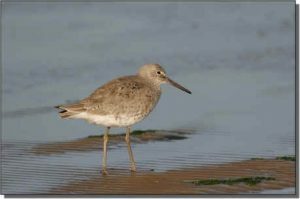 Comments: Willets breed in grassland-wetland landscapes in the central and northern Great Plains and winter along coastal areas from the southern United States through northern South America.